Sediment cores, which included the tiny plant and animal communities were collected from two fishing grounds in the Irish Sea. : Sandy sites were located off the east coast of the Isle of Man where scallop dredging occurs, whereas sand muddy sites were located off the coast of Cumbria, England, where trawling for fish occurs.A group of UK scientists, co-ordinated by the University of Southampton, has published extensive research into how industry and environmental change are affecting our seafloors, but say more work is needed to help safeguard these complex ecosystems and the benefits they provide to people for the future. Researchers from eight institutions and organisations have worked together to examine areas of sea or ocean located on the UK continental shelf to understand the sensitivity of these systems to human activities. The societal importance of these ecosystems extends beyond food production to include biodiversity, carbon cycling and storage, waste disposal, nutrient cycling, recreation and renewable energy. Martin Solan, lead principal investigator and Professor in Marine Ecology at the University of Southampton, comments: “Our seafloors are teaming with life, from microscopic organisms, to larger creatures such as fish and crabs. All interact as part of a complex system which plays a vital role in maintaining the health of the seabed and the rest of food web. Scientists from Bangor University’s School of Ocean Sciences studied the effects of human interference, from activities such as bottom-trawling, on how nitrogen is recycled on sandy and muddy sea-beds. They found that activities such as trawling were changing animal communities in the seabed which in turn affected microbial communities responsible for nitrogen cycling. This, in turn, may affect other processes taking place in the water column. 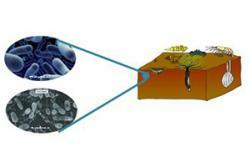 Microbes and seabed microscopic invertebrates interact in continental shelf sediments to play a major role in the biogeochemical cycling of organic matter. : Our research addressed the question “How do post-bottom fishing disturbance changes in macro-invertebrate community affect nitrogen cycling?”Dr Phil Williamson, from the University of East Anglia, who helped coordinate this research programme, commented: "Much of what happens in the sea is out of sight and out of mind. This study has provided a wealth of insights into the natural recycling processes that are literally at the base of marine ecosystems, underpinning the many benefits that we obtain from the sea." The variety of projects which the Biogeochemistry special issue brings together, were conducted on three dedicated research cruises and other expeditions around the UK. The research is part of a special issue of the scientific journal Biogeochemistry and includes contributions from the University of Southampton, the Centre for Environment, Fisheries and Aquaculture Science (CEFAS), the National Oceanography Centre (NOC), University of Portsmouth, University of Oxford, Bangor University, Plymouth Marine Laboratory and The Scottish Association for Marine Science (SAMS). 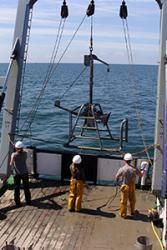 The research was part of the Shelf Sea Biogeochemistry programme, http://www.nerc.ac.uk/research/funded/programmes/shelfsea/ investigating how natural and human processes interact in the seas around the UK.